A beautiful beachfront home, Villa Sunset Resort is private paradise resting on the pristine Sunset beach on Oahu’s north shore. Sprawled over a ½ acre of property, this stunning three-story Hawaiian vacation home is a quiet retreat, offering breathtaking views and absolute tranquility. 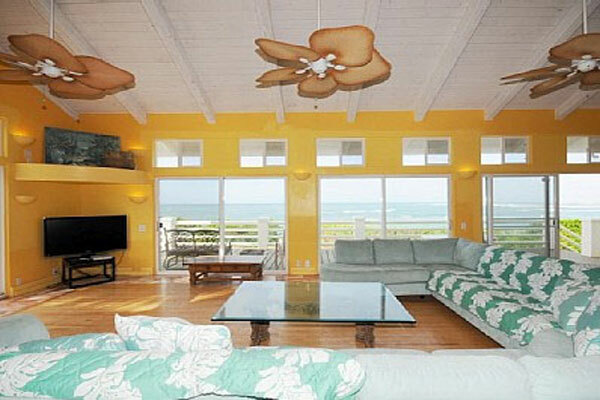 This five bedroom Oahu vacation villa is perfect for multiple families with children. One bedroom features three bunks perfect for little ones, while the others are perfectly appointed for the adults in the group. Brightly splashed in vibrant colors, this gorgeous home is warm and inviting. The paint and linens reflect the stunning colors of Hawaii, embracing the beauty of the islands. From Villa Sunset Resort’s wrap-around lanai, you can watch the sunset melt into the Pacific. During the day, epic ocean views reach beyond Oahu’s sandy beachfront and spread endlessly toward the horizon. Enjoy picnics with your toes sinking into the soft sand of the famous Sunset beach or dine al fresco by the pool. Kids and kids at heart will love all of the added amenities Villa Sunset Resort offers, including bicycles, pool table, air hockey, foosball, and kayaks. Just ten minutes from the shopping and nightlife of Haleiwa Town, you can enjoy the best of all worlds: the fun of downtown, the stunning beach, and the tranquility of Villa Sunset Resort.